Rich Harbour "2004 Local Hero"
Photo: Rich at his SWoF stone. Photo courtesy of Sharon Marshall. From the beginning, Rich Harbour was blessed with an affinity for woodworking an an eye for design. And while his first board may have been crude, by 1961 local ripper Denny Buell was already asking him to shape his boards. Then, in 1963, equipped with a $2,000 loan from his parents, he opened a surf shop at 329 Main Street in Seal Beach, the same location his store site today over 40 years later. 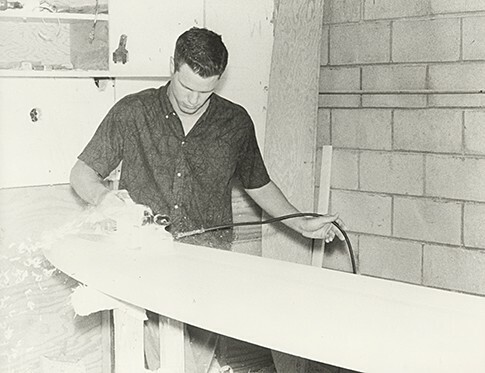 But it wasn't until 1967 when he brought in Robert August to shape some new, shorter boards that the business began to evolve. It was a time of great change, and surfboards were getting dramatically smaller. During the next decade he focused heavily on rocker, thickness and outline foils. 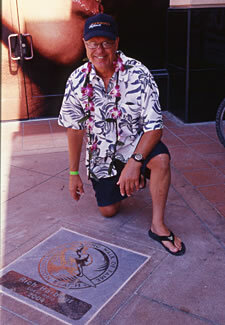 During the 1980's and harkened a return to his longboard designing roots. Experiments and refinements in modern longboard shapes, specifically v-bottoms, tail rocker and a unique channel nose concept dominated his attention. Rich spent the 1990's and early 2000's developing pro models, tweaking conventional boards, refining fin foils and fomulating blank plugs for Clark Foam.